Whether it is for a corporate event or for business marketing, screen printed t-shirts can be beneficial in more ways than one. It is going to be effective in terms of providing brand association. However, it cannot be effective at all times. There are certain factors that should be given attention, such as the design that will be printed and even the choice of the company to do the printing. Keep on reading and in the end, you will find it easier to decide on how you can end up with t-shirts that will perfectly match their intended purpose. There are many ways by which they can be differentiated, with the most common being the type of the sleeves that they have. Generally speaking, the following are the choices: sleeveless, cap sleeve, short-sleeve, 3/4 sleeve, and long sleeves. For t-shirts that are used for the purpose of branding, the most common would be those that are short sleeved, especially the ones that are made from cotton. They are known for being comfortable and useful for various applications, such as company uniforms or giveaways to clients. printed area will feel like. The appearance of the prints will seem like they have washed down. More so, you can also opt for large scale printing. This is common for t-shirts that are used for corporate events or marketing. You can also opt for specialty printing, which is essentially using certain kinds of inks, including those that we will be discussing next. The quality and appearance of screen printed t-shirts will depend on a number of factors and one of the most impactful would be the ink that will be used. One of the most popular would be water-based inks, although they are used exclusively on cotton t-shirts. Plastisol inks are also popularly used. They require heating up in order to dry, and they can be used on all types of fabrics. High-opacity inks, meanwhile, will be the perfect choice if you will be using dark coloured fabrics. For athletic wear, soft-hand inks will be perfect. There are also special effects inks, such as those that can glow in the dark. 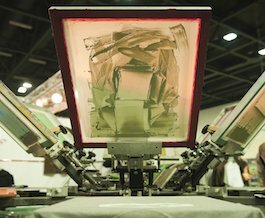 When it comes to screen printed t-shirts, more than just the shirt and ink, you should also pay attention to the design of the print. It must have colours that can be easily associated with your brand. The design can incorporate the name and the logo of the company, making it easier to create an association. It should also be captivating enough, especially if the intention is to use it for branding. The print can be large or small, depending on the budget that you will have. It is also important to create excellent contrast between the colour of the print and the shirt.